5000 Nigerians for National Thanksgiving on Buhari’s recovery – Royal Times of Nigeria. 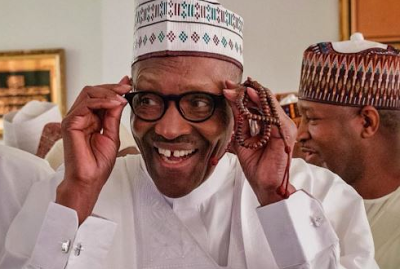 The National Inter-faith Thanksgiving Project for the Survival of President Muhammadu Buhari and Stability of Nigeria says it is moblising 5000 Nigerians for thanksgiving in appreciation of God’s restoration of the president’s health. Chairman Project Planning Committee, Mr Okeme Emmanuel, who briefed newsmen on Wednesday in Abuja, said the thanksgiving was also to appreciate God for Nigeria’s stability, qualification for 2018 World Cup and for exiting recession. He said that participants the thanksgiving session which would be he held at on Dec.12 at the Eagles Square, Abuja, would be drawn from all stata of Nigerian society. Emmanuel said that the thanksgiving was convened by the National Youth Council of Nigeria(NYCN), Initiative for the Promotion of Peace and Unity in Nigeria(PPUN) and the Peace Corps of Nigeria. He said, “No fewer than 5000 Nigerians, both young and old, men and women, Christians and Muslims, traditional rulers, government functionaries shall be moblised from across the 36 states and FCT. “More so, the international community, diplomatic corps, local and international media will participate in this historic event. “For a critical year like 2017, in which God has shown Nigeria so much mercies and kindness, as a corporate global citizen, it becomes most imperative for us to rise in one voice and thank God. Emmanuel said that as the nation approached the 2019 presidential election, it was wise to also use the platform to seek God’s guidance and directions. He listed some of the highlights of the session as ministrations and readings from the Holy Books—Bible and Quran, zonal thanksgiving processions from the six geo-political zones and national thanksgiving procession. According to him, a key highlight of the session is the lighting of the National Touch for Peace and Unity by the Father of the Day and former Head of State, retired Gen. Yakubu Gowon.